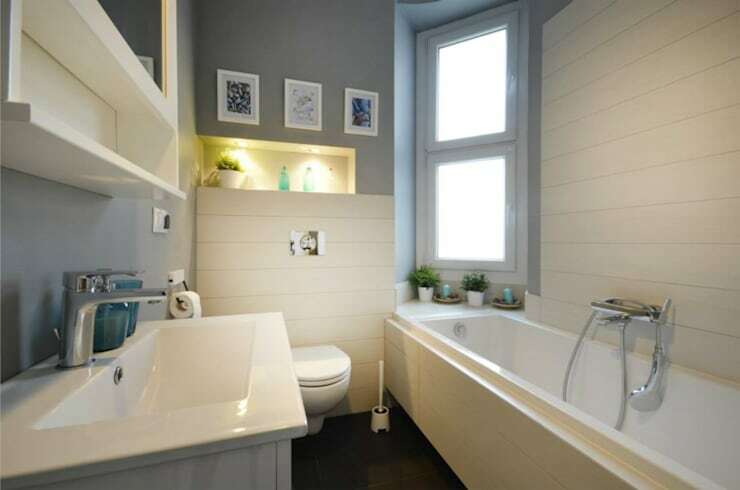 Bless the bathroom – it needs to be rather hidden away in a home, yet still has to provide adequate beauty and layout for when guests need to use it. On top of that, we demand that it has enough legroom, sufficient storage space, and goodness knows what else. No wonder the bathroom sometimes gets a bit tired and cries out for some help. That is when a stylish renovation is in order, and to serve as inspiration for your bathroom, we have gathered 7 stunning examples of old and tired bathrooms that have undergone sleek and striking makeovers. 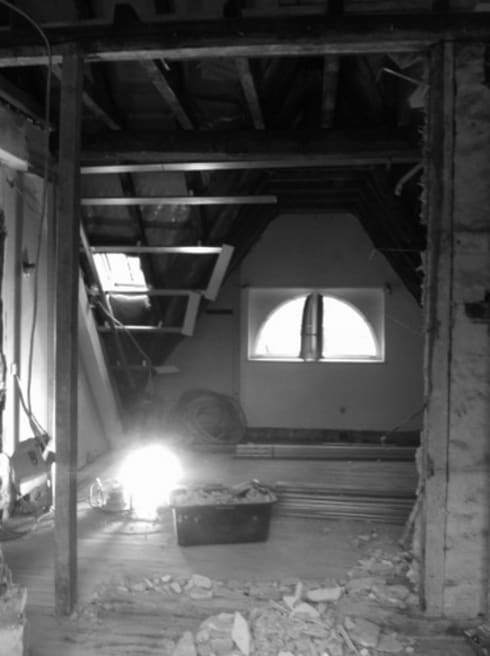 If that attic isn’t being used for storage, then you may as well turn it into a functional room. How about a bathroom, then? That slanted ceiling windows can make for a decadent flow of sunshine straight into a bubble bath. … that is exactly what they opted for! Although the area is not the most spacious ever seen, it affords one all the necessary luxuries to enjoy a stylish cleanse. 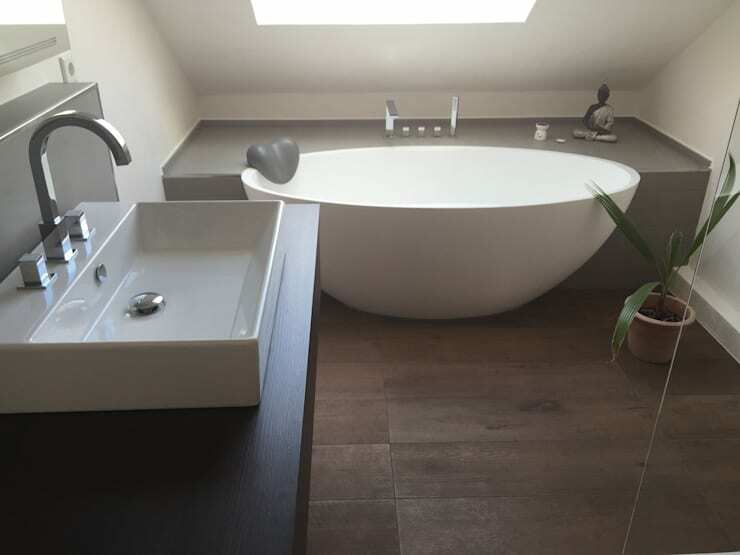 And with a gorgeous round tub like that, complete with neck support, who would worry about space? Once upon a time, dark brown tiles were in fashion. 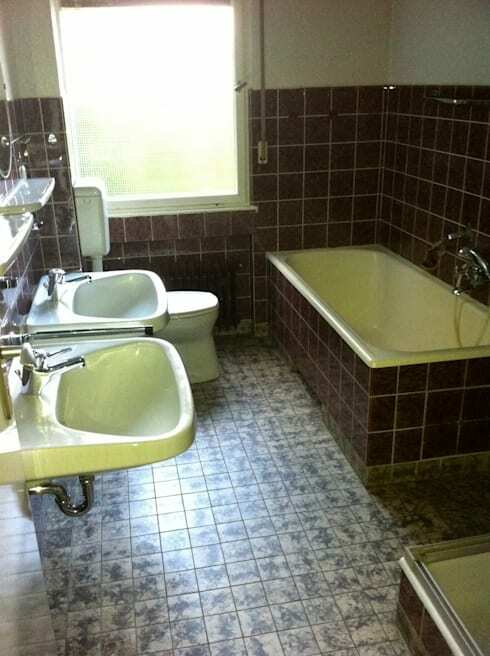 But times have changed, and sadly this bathroom is not the prim and proper space it used to be. What a fresh new look! Gone are the dark and gloomy tiles, and hello to the white and bright surfaces that inject a more modern look into the room. To free up even more space, the bathtub was removed and replaced by a glass-paned shower. A pebble-design floor ensures some pattern, while modern appliances make a sleek appearance in this hugely successful (in our opinion, at least) transformation. We again encounter a colour choice that was once a smash hit, but not anymore. 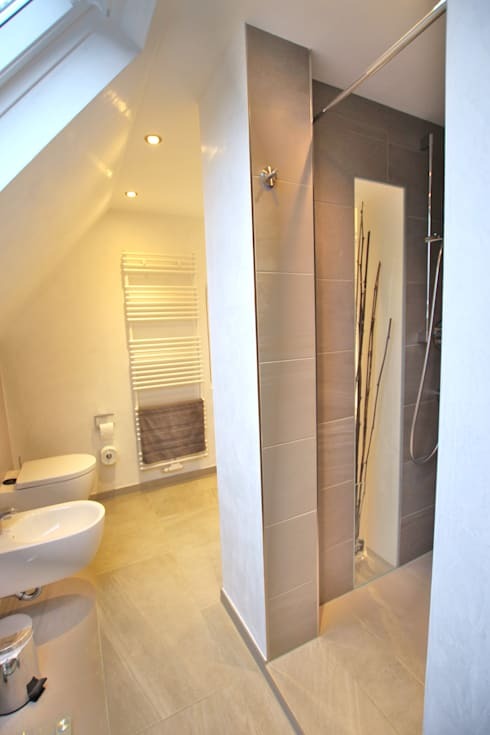 These brown tiles lend an outdated look to the bathroom, and also help to make it look more cramped and cluttered. Now this is a transformation done correctly! Gone are the dark and dreary colours, and in their place we find exquisite sand-coloured ceramic tiles and crisp-white walls. Sparkling downlighters and sleek new appliances complete the modern look, which works perfectly well in making this bathroom seem luminous and spacious, regardless of the slanted ceiling. Mosaic tiles can work a treat in the right space, but they can also make a room seem outdated rather quickly. 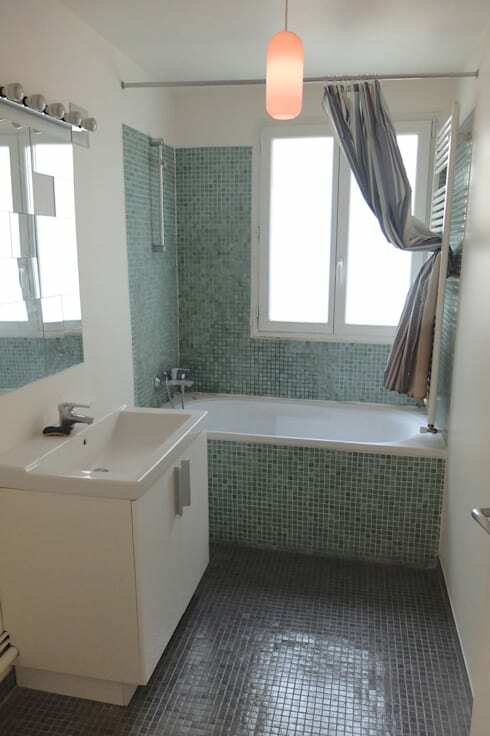 Such was the case with this bathroom – it shows promise, yet the tiling and colours just don’t work as well as they used to. Well hello, there! Thanks to some creativity and hard work, a sleek new bathroom is the end result. The bathtub made room for a very modern shower, while the cabinetry also got a stylish upgrade. And the colours: whites and blues make for a stunning look that lends a subtle nautical vibe to this fresh new space. 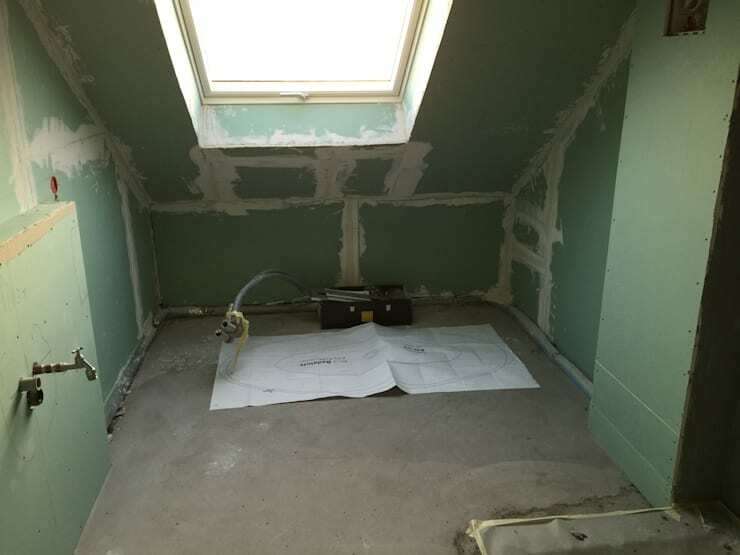 No need to be alarmed, this is not the bathroom in its ‘before’ state – rather the work in progress of a brand new bathroom being built from scratch. Shall we see how that turned out? Stunning! Whites and creams; tile and concrete, glass and ceramic; and a minimalist design to ensure a clean and neat look that is just the right amount of luxury and sophistication. 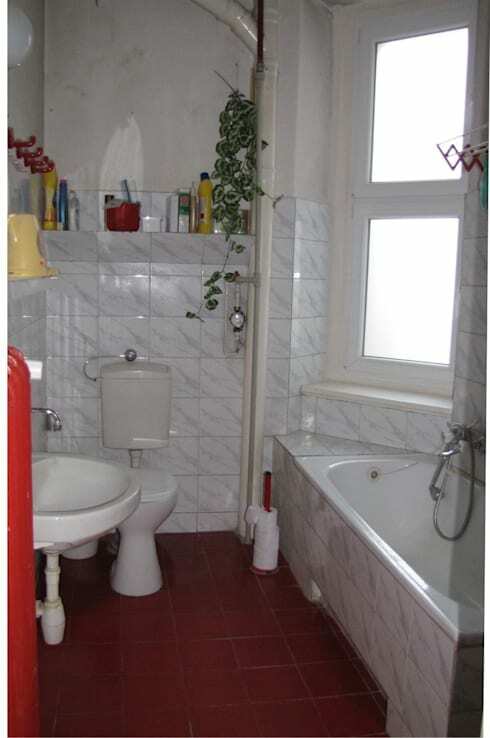 Another example of how bad designing can make a small space seem even smaller (although the clutter can’t be overlooked). That blood-red tone of the flooring is not doing anybody any favours, while the grey walls are simply begging to be included in the makeover. Cheers to sickening red, and hello to a stylish combination of grey-blues and neutrals. 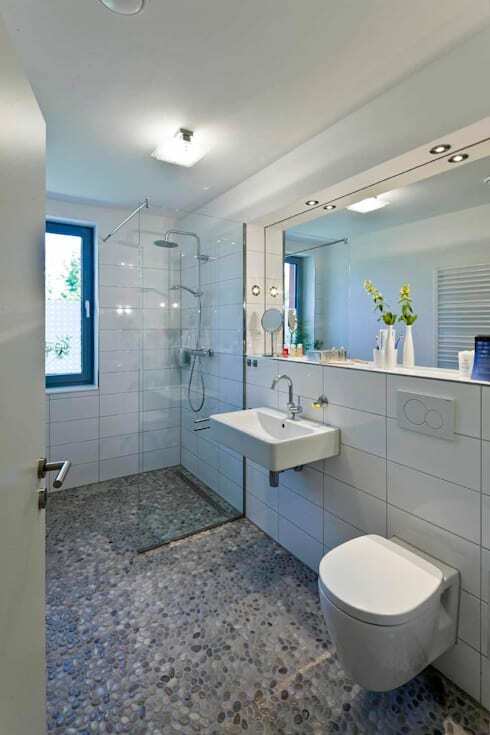 Both the floor- and wall tiles were replaced by more elegant counterparts, while the sink and toilet also received modern updates. And notice that the cluttered look is gone. All that’s left is a touch of stylish accessories that fit in perfectly with this new elegant space. No… just no! That old-fashioned wallpaper is enough to inspire depressing thoughts, while the pea-green appliances are sure signs of what not to do in this era. And again with the clutter… time for a change, and make it fast! Ah, now this is a space where we can breathe again. Whites and greys make a delightful alteration, while the new shower (with glass doors) takes up about half the amount of the old bathtub. And notice the new shelves underneath the sink, effectively taking care of anybody’s desires to bring back the cluttered look. Seeking some stylish inspiration? We’ll show you how to: Save time (and money) renovating your bathroom. We love hearing from you, so tell us which bathroom transformation is your favourite.